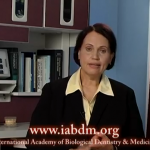 Click image to view Dr. Grube's introduction to biological dental medicine. From clinical awareness and scientific study, we know that what happens in the mouth is reflected in the body, and what happens in the body is reflected in the mouth. The IABDM is a network of dentists, physicians and allied health professionals committed to integrating body, mind, spirit and mouth in caring for the whole person. We offer superior educational opportunities; a respected certification credential; an inviting forum for the creative exchange of knowledge and ideas; and accurate, useful information for the public and profession alike.